HEY SALT LAKE CITY! HEADS UP AND FIND COVER! Say hello to the Nerf N-Force “Marauder”. Modeled after a two-handed European longsword, this is a follow-up to their smaller and thinner “Shadow Fury” and “Thunder Fury” swords which looked patterned after Chinese longswords. This one is bigger, thicker, tougher, and crazier. It measures at close to 3’5″ from tip to the bottom of the pommel, while the blade is a little over 2″. It’s weighty, too. I can’t attest if there is an internal plastic rod adding support to the blade, but it does feel plenty sturdy. It doesn’t flop around like the original models would, for sure. One inherent flaw with the original swords was they got beat up. Fast. The foam would scuff easily, the blades were a lot more spaghetti-like under vigorous usage and while awesome, there is a certain point where they just got destroyed. BUT, they were one-handed and it was easy to go double-swords. That and they looked cool. If you managed to even block darts shot at you, all the better. The Marauder improves on some of these issues. The foam is dense and thick. The outside is a bit glossy, I think to assist with the scuffing the original swords suffered. 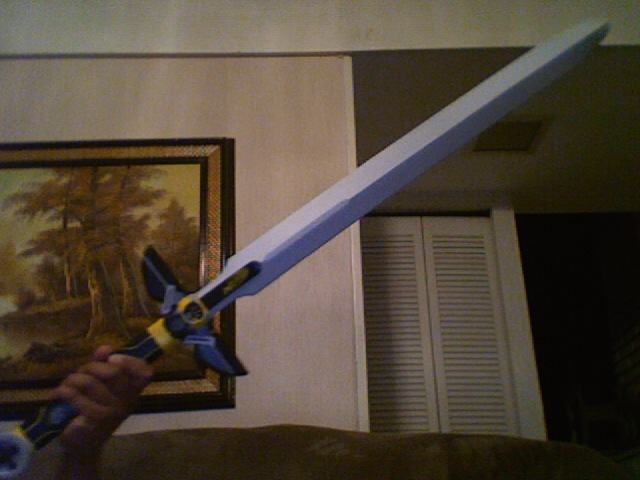 But it’s heavy and tough to wield one-handed, like a normal longsword. You swing slower, but you have reach over anyone armed with a Fury-series. Definitely do your research when trying to figure out how to use one of these. Like the warning says, DO NOT JAB OR POKE AT PEOPLE OR ANIMALS. Had to throw that in, because it’s written on the sword. Don’t be dangerous with it. Or a douche. Durability wise, I am concerned about the section where the hilt connects to the blade. It’s the smallest portion of the blade, and probably where a lot of stress will focus during swings and blocks. Just an observation. The rest of the toy, from the handle, the blade, the foam, it’s much denser foam this go around, and I look forward to using it. If your games allow swords to block darts, go nuts with the larger surface area. Just know the weaknesses of using a longsword as well, if you choose to go that way. I don’t intend to carry a primary with this, maybe a pistol splat if anything. It’s ungainly to carry and with the speed a nerf round can go, drawing it is very unlikely in time against anyone closing in on you worth their skills. You’d have better luck running around with it unsheathed if that’s what you choose to do. It’s listed at $25-$30, and if hand to hand is turning into your cup of tea, join the N-Force and grab one! Questions? Comments? Lemme know. P.S.- Big thanks to the “Wicked MC” for passing this my way!